From the very first days in our lives as programmers, we’ve all dealt with data structures: Arrays, linked lists, trees, sets, stacks and queues are our everyday companions, and the experienced programmer knows when and why to use them. 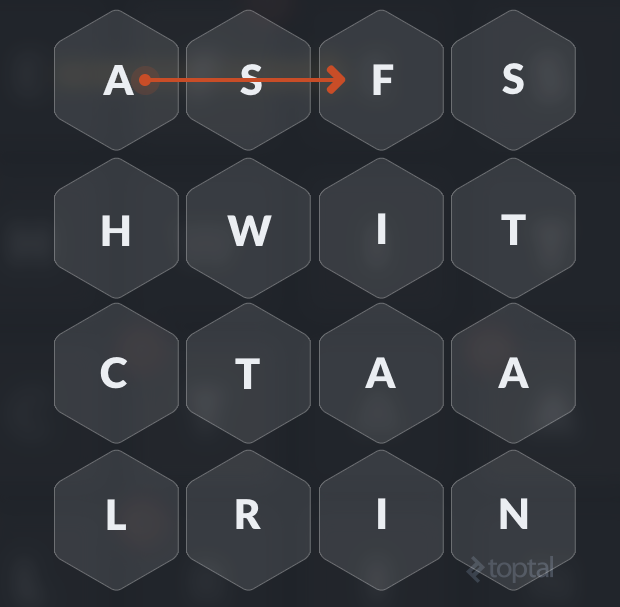 In this article we’ll see how an oft-neglected data structure, the trie, really shines in application domains with specific features, like word games. For starters, let’s consider a simple word puzzle: find all the valid words in a 4x4 letter board, connecting adjacent letters horizontally, vertically, or diagonally. For example, in the following board, we see the letters ‘W’, ‘A’, ‘I’, and ‘T’ connecting to form the word “WAIT”. The naive solution to finding all valids words would be to explore the board starting from the upper-left corner and then moving depth-first to longer sequences, starting again from the second letter in the first row, and so on. In a 4x4 board, allowing vertical, horizontal and diagonal moves, there are 12029640 sequences, ranging in length from one to sixteen characters. We only need a single copy of each word, i.e., our vocabulary is a set, from a logical point of view. Does the current character sequence comprise a valid word? Are there longer words that begin with this sequence? If not, we can abandon our depth-first exploration, as going deeper will not yield any valid words. To illustrate the second point, consider the following board: There’s no point in exploring subsequent moves, since there are no words in the dictionary that start with “ASF”. We’d love our data structure to answer these questions as quickly as possible. ~O(1) access time (for checking a sequence) would be ideal! Implementing the contains() method requires a backing data structure that lets you find elements efficiently, while the isPrefix() method requires us to find the “next greater element”, i.e. we need to keep the vocabulary sorted in some way. We can easily exclude hash-based sets from our list of candidates: while such a structure would give us constant-time checking for contains(), it would perform quite poorly on isPrefix(), in the worst case requiring that we scan the whole set. For quite the opposite reason, we can also exclude sorted linked-lists, as they require scanning the list at least up to the first element that is greater than or equal to the searched word or prefix. Two valid options are using a sorted array-backed list or a binary tree. On the sorted array-backed list we can use binary search to find the current sequence if present or the next greater element at a cost of O(log2(n)), where n is the number of words in the dictionary. // The prefix is not a word. Check where it would be inserted and get the next word. // If it starts with prefix, return true. In both cases, we can expect O(log n) performance for each access method (contains() and isPrefix()). As for space requirements, both the array-backed implementation and the tree-backed implementation requireO(n+M) where n is the number of words in the dictionary and M is the bytesize of the dictionary, i.e. the sum of the length of the strings in the dictionary. We can safely assume that all words are lowercase. We accept only a-z letters—no punctuation, no hyphens, no accents, etc. The dictionary contains many inflected forms: plurals, conjugated verbs, composite words (e.g., house –> housekeeper). Therefore, many words share the same stem. Words have a limited length. For example, if we are working on a 4x4 board, all words longer than 16 chars can be discarded. This is where the trie (pronounced “try”) comes in. But what exactly is a trie? Tries are neglected data structures, found in books but rarely in standard libraries. For motivation, let’s first consider Computer Science’s poster child: the binary tree. Now, when we analyze the performance of a binary tree and say operation x is O(log(n)), we’re constantly talking log base 2. But what if, instead of a binary tree, we used a ternary tree, where every node has three children (or, a fan-out of three). Then, we’d be talking log base 3. (That’s a performance improvement, albeit only by a constant factor.) Essentially, our trees would become wider but shorter, and we could perform fewer lookups as we don’t need to descend quite so deep. Taking things a step further, what if we had a tree with fan-out equal to the number of possible values of our datatype? This is the motivation behind the trie. And as you may have guessed, a trie is indeed a tree! Within a trie, words with the same stem (prefix) share the memory area that corresponds to the stem. To visualize the difference, let’s consider a small dictionary made of five words. Assume that the Greek letters indicate pointers, and note that in the trie, red characters indicate nodes holding valid words. As we know, in the tree the pointers to the children elements are usually implemented with a left and right variable, because the maximum fan-out is fixed at two. In a trie indexing an alphabet of 26 letters, each node has 26 possible children and, therefore, 26 possible pointers. Each node thus features an array of 26 (pointers to) sub-trees, where each value could either be null (if there is no such child) or another node. The LOWERCASE.getIndex(s.charAt(i)) method simply returns the position of the ith character in the alphabet. 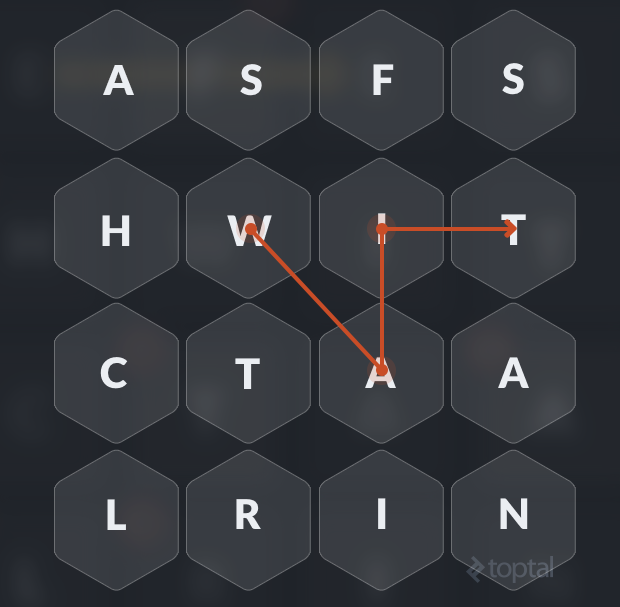 On the returned node, a Boolean property node indicates that the node corresponds to the last letter of a word, i.e. a letter marked in red in the previous example. Since each node keeps a counter of the number of children, if this counter is positive then there are longer words in the dictionary that have the current string as a prefix. Note: the node does not really need to keep a reference to the character that it corresponds to, because it’s implicit in its position in the trie. What makes the trie really perform well in these situations is that the cost of looking up a word or prefix is fixed and dependent only on the number of characters in the word and not on the size of the vocabulary. In our specific domain, since we have strings that are at most 16 characters, exactly 16 steps are necessary to find a word that is in the vocabulary, while any negative answer, i.e. the word or prefix is not in the trie, can be obtained in at most 16 steps as well! Considering that we have previously ignored the length of the string when calculating running time complexity for both the array-backed sorted list and the tree, which is hidden in the string comparisons, we can as well ignore it here and safely state that lookup is done in O(1) time. Considering space requirements (and remembering that we have indicated with M the bytesize of the dictionary), the trie could have M nodes in the worst case, if no two strings shared a prefix. But since we have observed that there is high degree of redundancy in the dictionary, there is a lot of compression to be done. The English dictionary that is used in the example code is 935,017 bytes and requires 250,264 nodes, with a compression ratio of about 73%. However, despite the compression, a trie will usually require more memory than a tree or array. This is because, for each node, at least 26 x sizeof(pointer) bytes are necessary, plus some overhead for the object and additional attributes. On a 64-bit machine, each node requires more than 200 bytes, whereas a string character requires a single byte, or two if we consider UTF strings. So, what about performance? The vocabulary implementations were tested in two different situations: checking for 20,000,000 random strings and finding all the words in 15,000 boards randomly generated from the same word list. The average number of moves made to solve the board is 2,188. For each move, a word lookup and a prefix lookup are done, i.e., for checking all the boards, more than 32M word lookups and 32M prefix lookups were performed. Note: these could be done in a single step, I kept them separated for clarity in the exposition. Compacting them in a single step would cut the time for solving the boards almost in half, and would probably favour the trie even more. As can be seen above, the word lookup perform better with the trie even when using strings, and is even faster when using alphabet indexes, with the latter performing more than twice as fast as a standard binary tree. The difference in solving the boards is even more evident, with the fast trie-alphabet-index solution being more than four times as fast as the list and the tree. 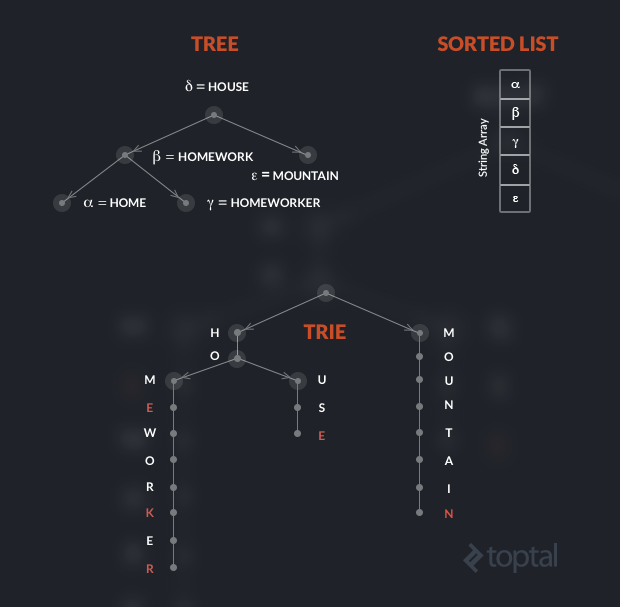 The trie is a very specialized data structure that requires much more memory than trees and lists. However, when specific domain characteristics apply, like a limited alphabet and high redundancy in the first part of the strings, it can be very effective in addressing performance optimization. An extensive explanation of tries and alphabets can be found in chapter 5 of Robert Sedgewick’s book “Algorithms, 4th edition”. The companion website at Princeton has the code for an implementation of Alphabet and TrieST that is more extensive than my example. Description of the trie and implementations for various languages can also be found on Wikipedia. This article was written by Anna Chiara Bellini, a Toptal Java developer. Buy me a beer ! I am a programmer. I post here in order to document some of the solutions to the problems I sometimes face in my line of work.